Below are a few isolated sound effects, some of which are not represented in the videos above. Merlin’s punch is the most important sound in the game, so I put a lot of effort into making it feel satisfying. But what is a punch without something to hit? I used a rubber ducky to make the starfish sound cute, bouncy, and rubbery when you punch it! 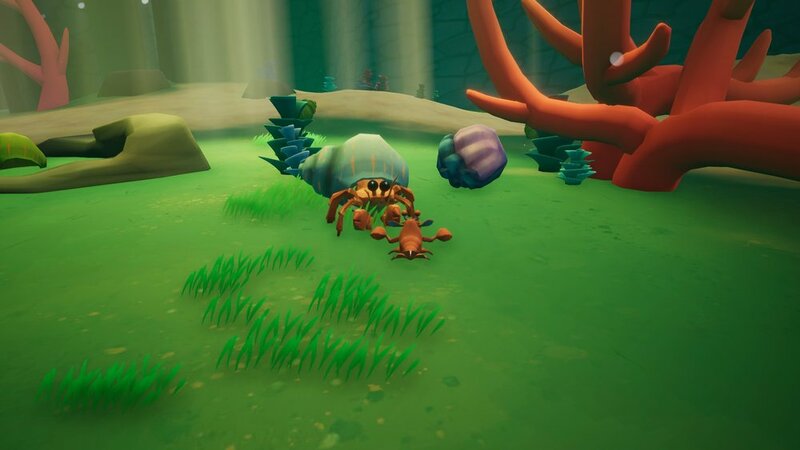 One of the most fun things I got to make were the sounds for the hermit crabs. This is as it shuffles up to poke you! And if you break the hermit crabs shell, it runs away! The sound of Friendshrimp would be horribly incomplete without Humphrey, the hapless academic and narrator of Merlin the Mantis Shrimp’s adventure (acted by the redoubtable Iain Nicklin). Our VO recording setup was pretty bare bones, so there was some sound cleanup to do as I edited these clips, but Iain’s fantastic performance as Humphrey sounds wonderful regardless. Here he is introducing himself and the objective of the game. A la The Stanley Parable, Humphrey responds to your decisions as a player. Here’s what happens if you stay still.